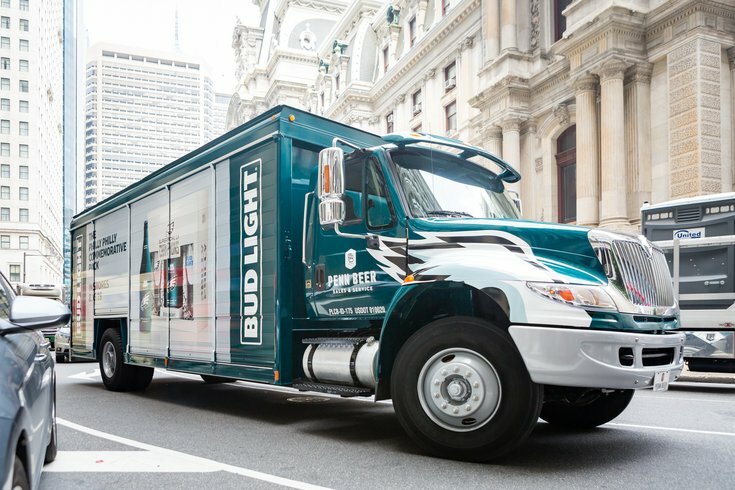 A Penn Beer Distributors truck with decals of Bud Light's Super Bowl LII "Philly Philly" Commemorative packs and Philadelphia Eagles-themed wings near Philadelphia City Hall, Thursday, Aug. 16, 2018. At Lincoln Financial Field, Philadelphia Eagles fans are paying the highest price per fluid ounce of beer in the National Football League. It's nice being the champions, but what's up with that? Team Marketing Report, a newly relaunched sports business intelligence source, recently published its 2018 NFL Fan Cost Index, which calculates the cost for a family of four to attend a game at every NFL stadium. For the 2018 season, the Super Bowl champion Eagles came in at number 10 in the league with a Fan Cost Index of $567.74 for a family to attend the game. That's with an average ticket price of $105.69. Things get dicey when it comes to the beer calculations. The minimum volume fans can buy at the Linc is 12 ounces for $9, which comes to a whopping 75 cents per ounce. The Dallas Cowboys (5) give their fans 16 ounces of beer for the same $9. The Giants (8) and Washington (4) each charge $9.50 for 16 ounces. Hell, the Vikings (14) sell a 20-ounce beer for $9.50. Compared to the Eagles' league-worst 75 cents per ounce, seven other teams offer their fans beer at 42 cents per ounce. In Baltimore, Houston, Denver, Atlanta, Detroit, Arizona and Cincinnati, a 12-ounce beer is just $5. Philadelphia fans have never shaken their reputation for rowdiness. Maybe the pricing is a containment strategy. Maybe Bud Light gave us all that free beer for our parade because they know they've been raking Philly fans over the coals on Sundays. Or maybe this is why Philly has the best tailgates in the NFL. You can't put a price on that.